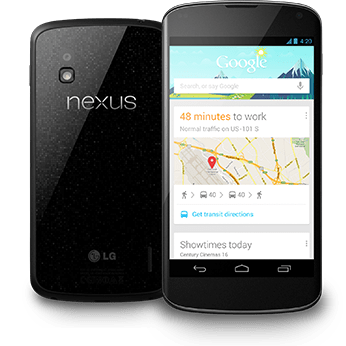 Google had an announcement canceled by the weather but they still put out the new devices including this Nexus 4 phone, the Nexus 10 and an update to the Nexus 7. While there was some leaks of what this new Nexus 4 phone would be here is the real info. It is a 4.7″, quad-core, wireless charging, and Android 4.2 devices. Wow lots in one sentence but they also updated some apps too such as a new swipe type keyboard called “Gesture Type” so you just run your finger over the letters to spell words, and a new camera app “Photo Sphere” that lets you do panoramas that go up and side to side. This phone will come in two sizes an 8GB and 16GB but at a great prices unlocked on GSM/HSPA+ networks starting at only $299 and $349 making this easy to get if you are in a contract but want a new devices. There is no LTE but HSPA+ is fast enough right now, and there are so many different LTE bands out right now you would have to put some more expensive chips in and that would drive the price up probably $100+. There is also the added SlimPort HDMI connection that is new. If you’re on a GSM network this looks like a good upgrade and it’s nice to be on the cutting edge of what other phone makers will add to their Android phones next year. There isn’t much information on the wireless charging yet but the make note of it on the Play Store website, most likely this will be an added $40-60 for the charging mat and isn’t included in the box. Will keep an eye out for accessories, but this would still be a good phone to get. Today Google was going to have an announcement in New York City but the weather caused them to cancel the release, but that didn’t stop them from giving us two new devices and an update to one. The first is an update to the Nexus 7, then a new Nexus 4 phone, and finally a Nexus 10 tablet. 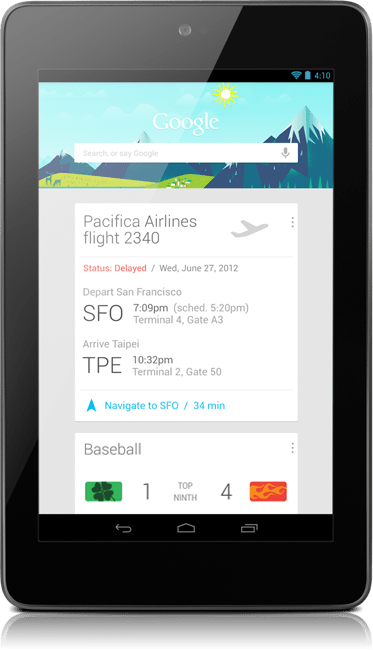 Plus they all run the updated Android 4.2, and have Google Now functionality for searching. 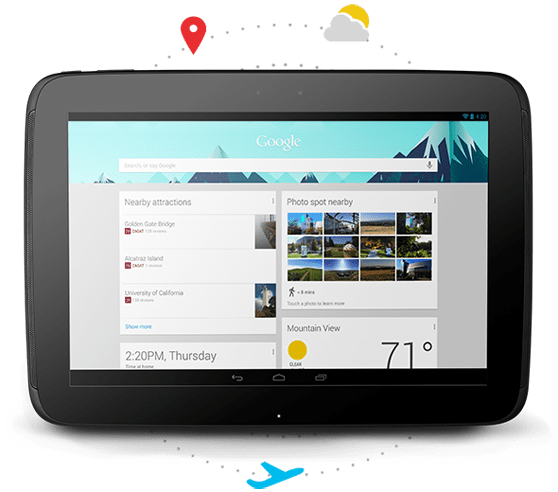 The Nexus 10 is a 10.055″ display at a 2560×1600 resolution, 9 hours of battery while playing video, front and back cameras, and multi user mode. It also comes in a 16 and 32 GB model, 2GB RAM, Dual-Core A15, Dual MiMO WiFi, and Micro HDMI. Looks like good specs but the images of the device make it look more rounded than a Nexus 7 so check out the gallery. Lots of users over at XDA-Developers Forum have started to get an update for their Google Nexus 7 tablets, this updates brings Android 4.1.2 Jellybean to the device. This isn’t a big update from what people have seen, it seems to increase performance and stability of the tablet along with bug fixes. The only real visible change is the ability to rotate the home screen in landscape mode. Below is a post on the Android Building Group. We’re releasing Android 4.1.2 to AOSP today, which is a minor update on top of 4.1.1. As a note to maintainers of community builds running on Nexus 7: please update to 4.1.2 at the first opportunity. Future variants of the grouper hardware will have a minor change in one of the components (the power management chip) that will not be compatible with 4.1.1. The build number is JZO54K, and the tag is android-4.1.2_r1. Technical Lead, Android Open Source Project, Google. I have been setting my Nexus 7 to look for an update but none yet for me, but thanks to user PTzero of XDA you can download the update from Google’s servers and flash the update yourself if you want. If you are like me you may just do this, and is reported to keep ROOT on your tablet if you have done that like I have. Otherwise wait a day or so and it should update your device. Got my Nexus 7 a few hours ago and after spending some time with it I am very impressed with the performance and how nice of a device it is. First thinking after getting it out of the box, and no I didn’t have the hard time that every unboxing video seemed to show about how the box was a hard thing to open, I turned it on and it was saying I had only 6% battery. That is kind of a bummer because you will spend a long time waiting for it to charge up, after about 2 hours charging on my old Nexus One charger I am only at 32%, and it will charge my Galaxy Nexus in about 1 ½ hours. It may be faster now that I’m using the supplied charger. As for the software you will have to update a lot of the stock apps right away, and there is an Android 4.1.1 update that you will need to do, but will have to wait until you get your device to above 25% battery. If you are an Android user already you will probably have a set of apps to install this takes time because you end up scrolling through a list of every app you have installed on any device using the Play Store to get the ones you want. I got a lot of news and reading apps loaded along with some video apps such as Netflix and Hulu along with my music apps like DI.FM and SKY.FM. Because I got it from the Play Store I got a $25 credit that showed up in my email after I logged into the Nexus 7. It also came with Transformers: Dark of the Moon as a free movie to show how it works, and it streamed easy and fast over my Cable Internet connection. It also came with some magazines that you can look at. The Popular Science that they give you was nice, you can go to a page and then zoom in on a piece of text and it makes it look good, or you can just read the text in a different layout without the images though. I did open the Kindle book app and look it over, it was nice on the bigger screen I have used it on a phone but didn’t seem to want to read much because it was a lot of page scrolling and not much reading, and on my big ASUS EP121 Windows Tablet it was nice but too big and heavy, but I did like it on the Nexus 7. As for Google Books I loaded the manual but it was spending a lot of time loading the next page trying to scroll though the book, that problem went away after letting it finish downloading the book. Using apps like Flipboard and Currents was nice to read news and articles. Also using Chrome as a web browser was nice because it displayed content like a desktop but easily zoomed in when the text was too small to read easy. Google+ is also optimized for a tablet experience but Facebook was just an expanded mobile version. The sound from the speaker was ok for watching YouTube and having some music playing but wasn’t that good that you wouldn’t want to have some headphones for longer listening sessions. The microphone was able to pick up my speech to text input easy enough using the Google Now cards and search. As for the camera you don’t get a full Camera app, but you can install other camera apps or use one called “Camera Launcher for Nexus 7” that will add an icon to use the Jelly Bean camera. Also some camera apps such as Camera ZOOM FX won’t install. The quality of the camera was ok and only good enough for video chat and things like that any ways. As an update to the battery charging make sure you use the supplied charger it took me 45 minutes to work through this article and I went from 32% to 51% in the time I started to getting to this point, so the charge time isn’t that bad with the right charger. Overall I like the Nexus 7 and expect to have lots of fun with it, I think I’ll get a case for it, Amazon.com had a few that have the magnets to make it wakeup and sleep depending on if the cover is open or closed like the iPad “not so” magic cover that only cost $20. So if you were thinking of getting a Nexus 7 go ahead and get it, the price is right at $199 and the hardware is good! 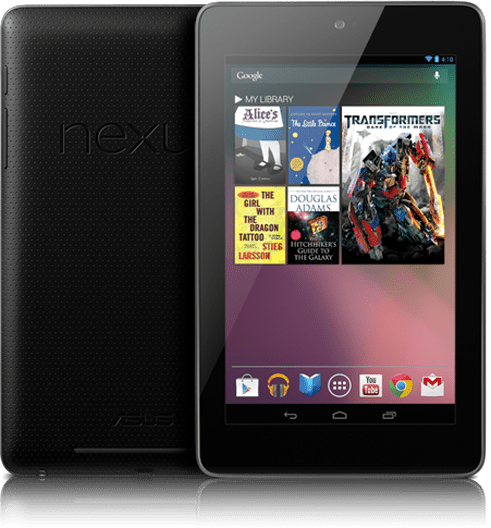 Back at Google IO12 the Nexus 7 was introduced as the reference tablet for Android 4.1 Jelly Bean. The price was set at $199 for 8GB and $249 for 16GB model. It has a 7 inch screen, Android 4.1 and a quad-core processer all top of the line but in an inexpensive package. This was made to show other device makers what type of device Google wants to see made. After seeing the power of the device and that I have wanted an Android based tablet I ordered one as a gift to myself for getting though school. It arrives tomorrow but I thought to give an overview of the specs and my thoughts on the device. I will add an update when I get mine up and running. 7″ IPS back lit HD screen, Android 4.1 Jelly Bean, 8 or 16 GB of internal storage, 1 GB RAM, Quad-core Tegra 3 processor, ~8 hours battery life, WiFi, Bluetooth, NFC, GPS, and Micro USB. Ok that was a lot of stuff, but what really matters is that it has a fast processer on a good looking screen with lots of internal goodies. At this point there is no 3G/4G networking option, and the only camera is a 1.2 MP on the front, but from reports there is space in the device for a rear camera and 3G antennas already built in. So if you’re looking to get a tablet for a nice price with good specifications and the latest software this is a good device to look into. Even iPad fans that love there Apple devices think that this is a good tablet to have.